Feel anxious, stressed, or tired? This deck provides you with 56 useful and effective anti-anxiety strategies to help you relax. 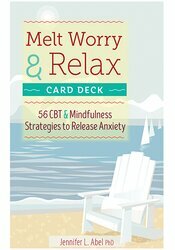 Based in cognitive therapy, mindfulness, relaxation and behavioral therapy, each card will help you melt worry and anxiety quickly and easily.